1. Envelopes - The United States Postal Service requires envelopes to be rectangular shaped in order to qualify for letter prices. Length must be between 5" to 11.5" and height must be between 3.5" to 6 1/8". Acceptable thickness is from .007" to 1/4" and weight should not go over 13 ounces. Large envelopes should have a maximum size of 15" (L) x 12" (H) and should not go over 3/4" thickness. If a large envelope exceeds these specifications, it will be charges package price rates. 2. Postcards - Postcards should also be rectangular in order to qualify for USPS First-Class Mail prices. Length must be between 5.5" to 6" and height must be between 3.5" to 4 1/4". Acceptable thickness is from .007" to 1/4". 3. Packages - Shipping options for packages include USPS Priority Mail Express, Priority Mail, First-Class Mail Parcels, Standard Post and Package Services. It's contents must not weigh more than 70 lbs. 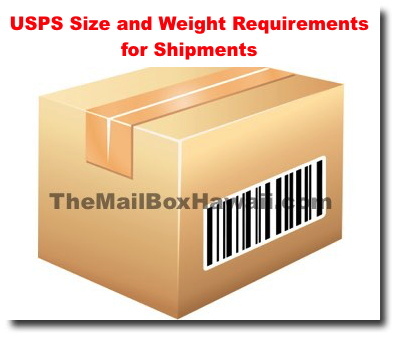 (Lower weight limits may also apply so be sure to check with with your local post office). Maximum size is measured by the length + distance around the largest point and should not go over 130 inches.